This USB charger seat is designed for Attop XT-1 drone, 3 in 1 feature meaning it can charge for 3 batteries at the same time, which is the best choice for you to enjoy more flying joys. Especially designed for the 3.7V 800mAh lipo battery of XT-1 drone. 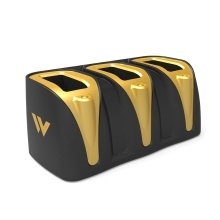 3 in 1 charger, meaning you can charge three batteries at the same time.